Original Art from Startling Stories: The Thing! 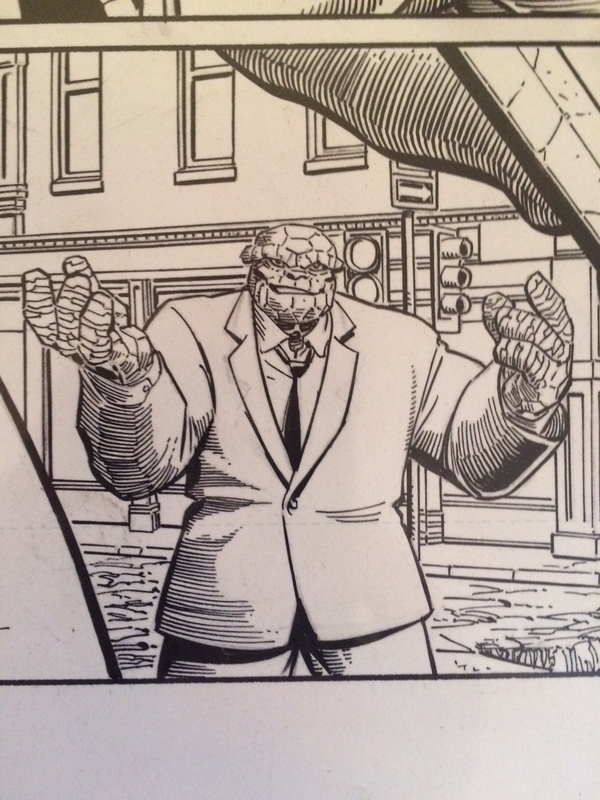 I got a new page of artwork in the mail recently, and wanted to show it off. This page features, of course, The Thing, with line art by Don Kramer and Scott Hanna. 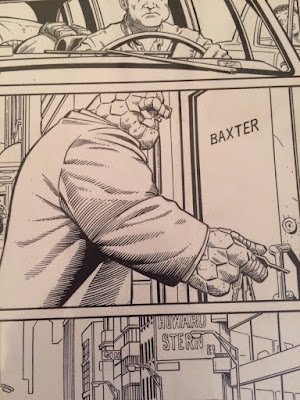 There's a lot to like about this page, and one of the big things that drew me to it was the fact that the Thing isn't punching stuff or having a building dropped on his head or anything like that. Don't get me wrong, I love seeing the Thing punch stuff, but it's nice to see something different every now and then, right? This is what I like to think that the Thing does when he's not out on some adventure. He's riding in a car or looking for his keys or something, just like you or me. This particular story was written by Ron Zimmerman, who had a run on a few Marvel titles about ten years back and is supposedly friends with EIC Joe Quesada. Rumor has it that he took comic book criticisms too personally and backed out from many of his writing duties. He also has ties to Howard Stern and his show, and we can see on this page that the program gets a mention in the background. The book that this page comes from is a "Startling Stories" one shot, at least unofficially subtitled "Last Line of Defense". 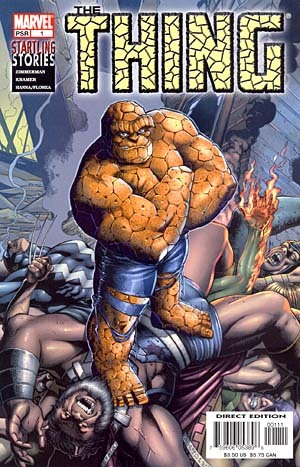 Back in the earlier part of the century, Marvel gave the Thing a number of miniseries that eventually led to his brief second ongoing series in 2006. This issue was part of the Startling Stories line, which featured stories that weren't necessarily in continuity (and were at least solicited as being for a more mature audience). There's nothing about this issue that should keep it from being a part of the Thing's history, though, and honestly, it comes off as kind of an average Thing story, but I enjoyed it if nothing else than for the Thing/Hulk standoff that ended the oversized issue. Pencilled lightly at the top of the page is "Startling Stories". 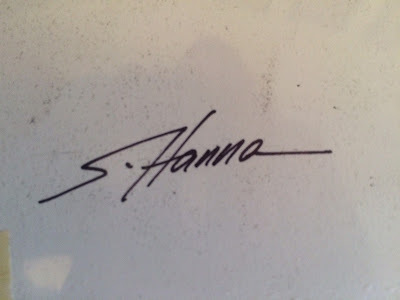 On the back, we find inker Scott Hanna's autograph. This is actually the second page I own with Scott's original inks, the other being a page where he inks over the blue line printout of another artist's pencils. This page contains Kramer's original pencils as well. I'm happy to add this to the collection! I found a few other pages from this issue online as well. Who knows, maybe one day I'll add one or two more.